Since around the time I was 5 months pregnant with my oldest child, my son, I’ve been consciously aware of the negative stigma around letting your kids watch t.v. from a young age. I didn’t do a lot about it, but if my kids spend more than 3 consecutive hours (or 4 total in a day) sitting in front of the tube I start feeling a little anxiety about my “bad parenting” abilities. Scarlet spends a few hours in the morning after Abel leaves watching Doc McStuffins and Sofia the First. Then in the afternoon after Abel get’s home, they both watch about an hour of something else. This isn’t a constant schedule either. We have at least 3 days every week where we don’t turn it on at all and those days typically function just as well as the others. And we have a family movie at least once, if not twice, every week. It adds up to a lot of time in front of the screen, but I like to give myself a mental break about it lately, because pretty much anything done with precaution and moderation is going to be just fine. No, my kids don’t watch t.v. with their food. I personally rely on the Disney Jr. Channel (and whatever Peppa Pig is on) to entertain the kids for various reasons, including but not limited to the following situations. 1) When I haven’t had a morning shower in a week or two and I don’t feel like waiting to take my shower later. 2) When I absolutely don’t want them playing in their playroom/rooms upstairs for at least an hour because it somehow took 3 hours to clean up their toys last night and I don’t want it to go to waste too quickly. *This is totally a purely selfish reason, I know. 3) When just coloring (which always takes place in the office, due to needing direct supervision) isn’t going to cut it, since Mommy needs to get stuff done and they keep arguing over who needs the blue crayon more. 4) When it’s too cold/rainy/hot to play outside. 5) When I didn’t sleep well the night before and the living room is the only place where I can close my eyes and still keep an eye (or ear rather) on them. Today I came up with a new reason. 6) When I have to get stuff done during the school day but I have to pick up Mr. Kindergarten because he puked twice within two hours of being there. “I have work to do, if you two want to watch Mickey Mouse clubhouse until lunch, you can.” works fairly well to buy myself an extra hour of productivity. It’s definitely easier to have independent play and planned activities for just Scarlet while Abel’s at school, so I’m sure they spend a bit more time watching t.v. when they’re together versus when it’s just her and I. When do you desperately need the television for just a minute? 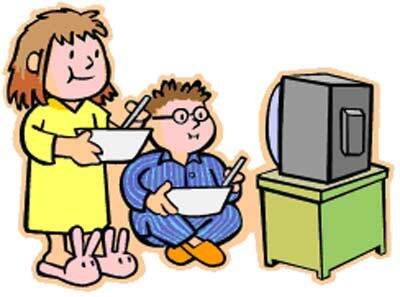 Do you keep track of the amount of time per day/week the kids watch t.v.? Do you have “no television” days or weeks? I find when I am prepping dinner the TV keeps those who aren’t helping occupied! Thanks for sharing! I absolutely agree Trisha! We have a no kids in kitchen rule during dinner prep (except on kid’s cooking night) and the t.v. babysits about half the time with that.